This book was simply deep, ugly crying, and breathtakingly emotional. I was a utter and total wreck. Bought all my emotions out for good and even horrible reasons. I was so pulled into this story emotionally and mentally it felt like my own heart was breaking, it was ripped out, stamped out, stabbed a few times and tossed in the trash. My first book of Jessica Park and it's blew me away!! This author is def one of my favourites. This book gave me everything from total elation to absolute heartbreak and everything in between. 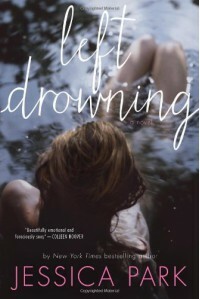 Left Drowning is a powerful story of how shattering events in the past connect with the present and the future. How it haunts and drowns itself .The key is not to forget, not to accept, not always to forgive in order to move on...but to breathe. To find strength in others and to build a foundation based on love and trust in order to survive. Thank you for a truly magnificent read! Well, on the other hand, Chris did everything to my heart starting from crying to make it go steamy!! Flipping fantastic HOT!